2. 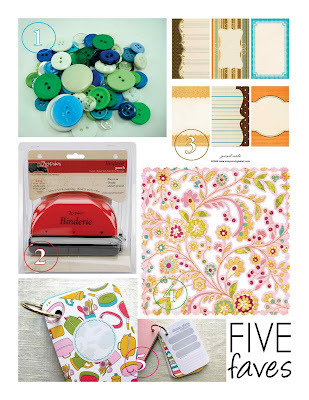 Binderie Punch Starter Kit by 7Gypsies. Available at scrapbooking-warehouse.com. I stumbled across this little thing and am thinking this might be a great tool to have! From a trusted name (7Gypsies), it is probably a fabulous way to punch holes to make booklets, albums, etc. And at only $35 -- much more affordable than taking the plunge with some other punchers out there. 3. Printable Journaling Cards: Digital File by TracyAnnDigitalArt. Beautiful journaling cards! 4. BasicGrey - Lemonade Collection Doilies - 12 x 12 Diecut paper available at scrapbook.com. 5. Mini Meal Planner by smbriones. Oh.my.word. Is this not the cutest thing ever! What a GREAT idea!